I ask your prayers today as I leave to begin my three-week teaching mission to India. 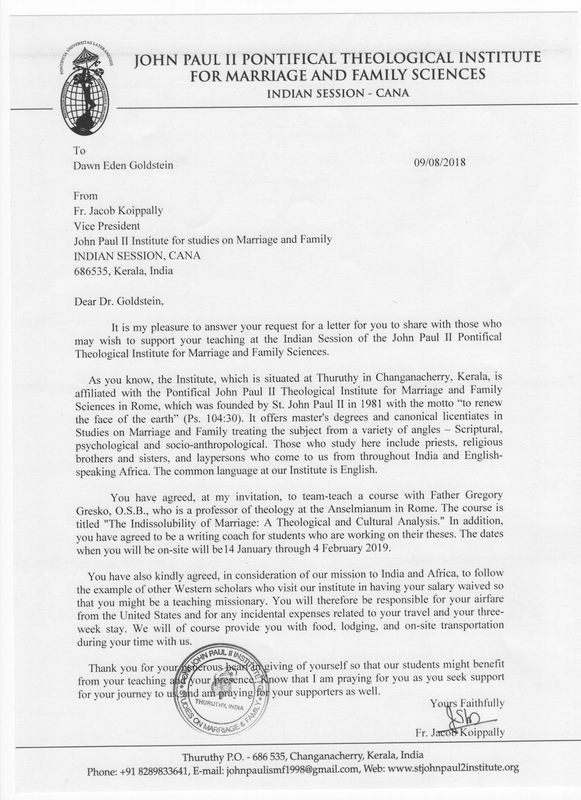 There I will be team-teaching an intensive course on the indissolubility of marriage at the Indian Session of the John Paul II Pontifical Theological Institute for Marriage and Family Sciences in Kerala with Father Gregory Gresko, O.S.B., professor of theology at the Pontifical University Sant’Anselmo in Rome. Father Gresko, who is originally from Virginia, teaches an intensive course at the Institute each January on a theological topic related to the Institute's mission of promoting studies in marriage and family. It was at his invitation, confirmed by Institute Vice President Father Jacob Koippally, that I received the opportunity to make this mission. As I have written earlier, this mission is for me the fulfillment of a longtime dream to use my knowledge as a doctor of sacred theology to help Catholics in the developing world, where the rapidly growing Church has a great need of teachers. Here is the letter from Father Koippally in which he confirmed my invitation and provided details of my teaching mission. Father Gresko and I will have about forty students in our class, including lay people, religious, deacons, and priests from throughout India and English-speaking Africa. Our course will be part of the Institute's canonical-licentiate program. (A canonical licentiate, which is issued under the authority of the Holy See, is the minimum degree required for teaching on the seminary level and is a necessary prerequisite for a canonical doctorate.) The language of the Institute is English. 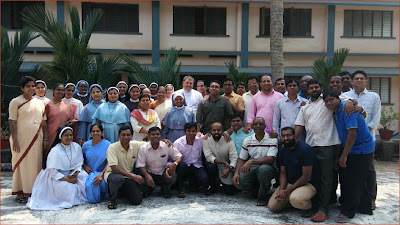 Father Gresko (in white at center of back row) stands with his students at the Indian Session of the John Paul II Pontifical Theological Institute for Marriage and Family Sciences in January 2017. 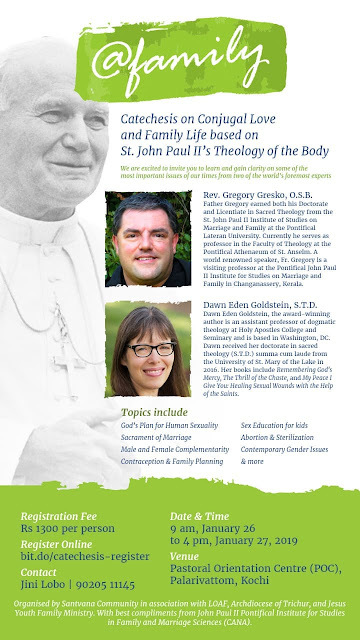 In addition to teaching at the Institute, Father Gresko and I will be speaking at symposiums in Bangalore and Cochin (Kochi) about Catholic teaching on marriage and sexuality. 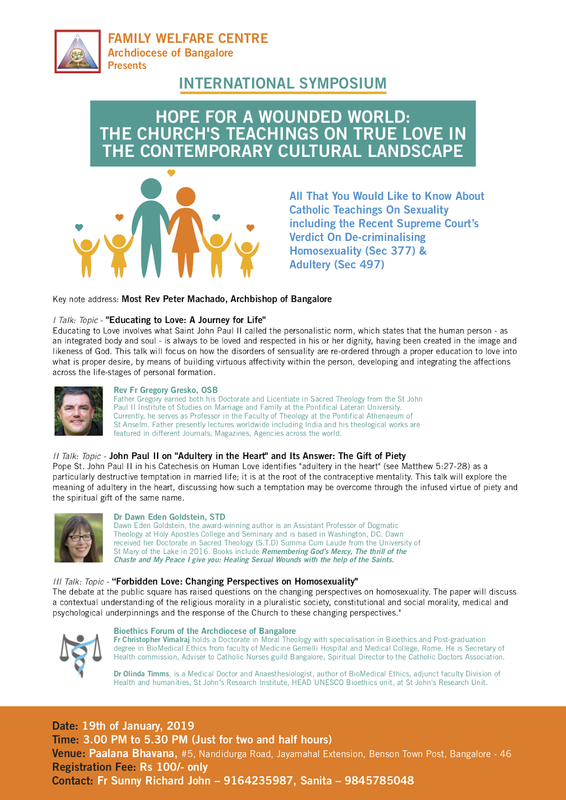 Here is a flyer for the Bangalore conference. After Father Gregory and I finish teaching but before we return to the States, we will spend two days with the Daughters of Mary in Kanniyakumari, who run the Stella Maris Institute of Development Studies. I am looking forward very much to witnessing their outreach to traumatized women and to visiting the Leprosy Rehabilitation Center that they administer. Thank you for your prayers as I set out for what promises to be an exciting mission experience. Everyone who supports my apostolate in any way is in my prayers every day. God bless you! Update, January 14: I arrived safely after more than twenty-four hours of travel and all is well. Many thanks for your prayers; they helped me as I made a tight connection in Abu Dhabi after my flight from Dulles International Airport was delayed due to snow. Must get sleep now, but had to share this lovely flyer for the workshop Father Gresko and I are giving in Kochi.